Fasten your bracelets easily with this comfortable ergonomic design. Perfect for almost any bracelet in metal, beaded, leather, macrame, and other materials. • Bracelet Magic is very user friendly. You don't have to grip anything, a real benefit for those who suffer from arthritis, weakness, or hand tremors. • Easy to use right away. First, insert the hook into the jump ring. Next, put the Bracelet Magic loop over a finger of your bracelet hand, with the charm facing you. Pinch open the clasp of your bracelet, swing it behind and around your wrist, and fasten. Then remove the Bracelet Magic loop from your finger, and remove the hook from the jump ring. That's all there is to it! • High quality materials are designed to last; no chipping or flaking because there are no plastic parts. The hand-crafted hook design is gentle on your jewelry. • Packaged with care in a gorgeous peacock blue wrapper with silver foil seal; illustrated instructions are included with each Bracelet Magic. • Themis Designs is a woman owned Oregon-based company. If you've given up on your favorite bracelets because it's too much trouble to put them on, we sincerely hope Bracelet Magic will help you to enjoy wearing them again. Fasten your bracelet quickly with a minimum of hand, wrist and finger movements. Ideal for anyone who has trouble gripping or flexing their fingers. Especially helpful if you suffer from arthritis. Keeps your bracelet steady while you fasten it; no more chasing the jump ring or toggle end around your wrist. Works great with almost any clasp. Created and designed by a woman jeweler, this bracelet helper combines function and beauty. Made in U.S.A.; each piece is crafted by hand to jewelry standards. A thoughtful gift for someone you care about, and the perfect accessory to help you with your own bracelets. 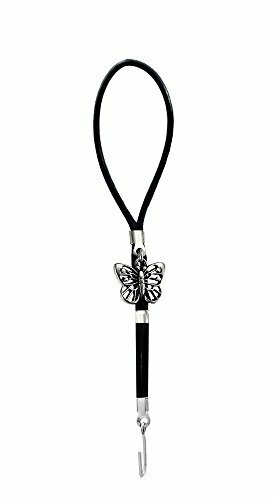 Fancy cut-out butterfly charm with antique silver finish, made in USA. High quality Greek leather cord. If you have any questions about this product by Bracelet Magic, contact us by completing and submitting the form below. If you are looking for a specif part number, please include it with your message.